2 x baits soft hooks. 2 unids lead head soft for bait fishing enthusiasts. all our photos are made using light that is as close to natural as possible and avoid color variation. Due to the light and screen difference, the item's color may be slightly different from the pictures. Treble hook bait fishing, the fish is difficult to escape. 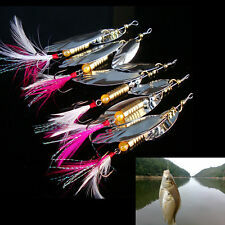 1 x 5PCS Fishing Lures Suit. Suitable for fishing lovers. Bright colors to attract big fish in water. Hook is super sharp, keep it away from kids. 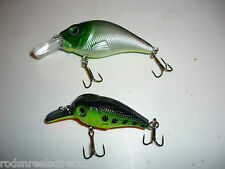 Set of 2 x New Rattling Plug/Lures. Great for all predator fishing, these lures work! Green with Orange underside. Green & Silver. 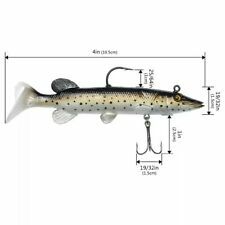 1 psc True Pike Soft Swimbait Saltwater Bass Fishing Lure 10.5 cm 14gr Brown. Condition is New. Dispatched with Royal Mail 2nd Class. Bead colors are random. Size: 10cm x 5cm x 2cm. Type: 5.5g. Color: as shown. 1 High Quality Sinking Swimbait. 142mm body length 27g. Minnow Lure. Technique: Casting & Trolling. Because we ensure that the quality of our plastics are strong and durable with the perfect imitation to fool the wariest of fish. This the JOINTED Hi-LO style lure is a great lure. Great for Pike, Zander, Perch and other predatory fish. 110 mm lip to tail (95 mm lure body without lip) - 17 g in RED TIGER. very rare Swedish made LURE. 1 High Quality Sinking Swimbait Minnow. Lure 142mm body length 27g. Technique: Casting & Trolling. Because we ensure that the quality of our plastics are strong and durable with the perfect imitation to fool the wariest of fish. This the JOINTED Hi-LO style lure is a great lure. Great for Pike, Zander, Perch and other predatory fish. 110 mm lip to tail (95 mm lure body without lip) - 17 g in. very rare Swedish made LURE. Top quality & life like action. Anglers Works Lure kit 4 X 70mm diving plugs. Internal Rattle To attract Fish. Ideal For Salmon / Pike Fishing. 2 Sets of 2 x New Rattling Plug/Lures. Great for all predator fishing. these lures work! You will recieve 4 lures. 2 x Green with Orange underside. 2 x Green & Silver. Each plug has 2 sets of trebles. IDEAL FOR TROUT / PIKE / PERCH & MANY OTHER SPECIES. FREE TACKLE BOX. COMPLETE WITH TACKLE BOX. SET OF 8 SPINNERS / PLUGS / LURES. Proven fish catchers. 18.5cm x 22g Crankbait. 1 High Quality Floating Diving Plug Minnow. 185mm diving fishing lure with 3 hooks. Diving Depth 0.5m-1.5m. Technique: Casting & Trolling. Strong flash on roll. Because we ensure that the quality of our plastics are strong and durable with the perfect imitation to fool the wariest of fish. This Hi-LO style lure is a great lure. Great for Pike, Zander, Perch and other predatory fish. 90 mm lip to tail (75 mm lure body without lip) - 13 g in FIRE TIGER. very rare Swedish made LURE. Top quality & life like action. crankbait fishing lure DT 11cm diving lures x 8 pike bass zander. Awesome golfball texture diving lures, top quality lures with razor sharp hooks. Rare dimple lures in colours pictured. This Fishing Lures Kit includes: 8pcs three hook hard bait, 46pcs soft bait, 10pcs sequins lures, 36pcs lures accessories and one tackle box. Our Fishing Lures Set is suitable for both freshwater and saltwater. Pike fishing lure . perfect swim-bait. Minnow Viper lure 3D. New version . Superb for all predatory fish, one of the wiggliest crank baits i ever seen,a jointed body/tail that wiggle and drive fish crazy. a great lure for bass too. 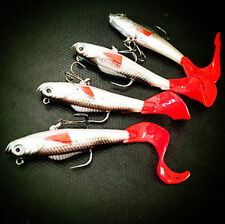 - don't miss-out on this classic pike lure -. 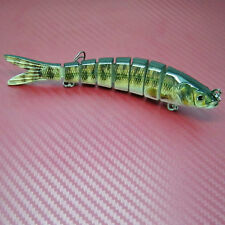 MINNOW LURE PLUG TYPE FISHING PLUG LURE PIKE PERCH ZANDER PIKE PERCH. 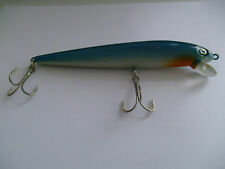 GREEN STRIPES ADDED WITH PAINT TO BOTH SIDES/FLANKS OF THIS LURE UNFISHED UNBOXED NEVER USED - see pictures. Bead colors are random. Color: as shown. Stunning laser printed real Jack Pike, TOXIC VIOLET JACK, 20.5cm 70g sinking, made up of 8 sections with tough silicone fins, long cast lure sinking to any depth, smooth rattling swim action just like the real thing. IDEAL FOR CASTING & TROLLING ALIKE. PIKE FISHING. Here is 2 big Pike lure/Jerkbait. In good order. PIKE PERCH ZANDER BASS LURE PLUG SURFACE PLUG BAIT. PLUG SURFACE PLUG. MODIFIED, CENTRAL TREBLE HOOK REMOVED, HOLE STILL REMAINS SO ANOTHER TREBLE CAN BE INSERTED, ANOTHER HOLE DRILLED AND FILLED WITH BALL BEARINGS TO MAKE A RATTLE MOST LIKELY UNUSED NEVER FISHED BUT MARKS FROM STORAGE AND MODIFICATIONS. Carp Fishing. u Good at prowling bass, walleye, pike and striper. The sound and unique action make this a can’t miss lure for your tackle box. Fishing Lures Hardbait Minnow 70mm 4g Black HSF8A. Fly Fishing. Carp Fishing. Hard Baits Black Minnow 45mm 3g Bass Pike HCK3A. This kind of minnows features a realistic profile to act as a real fish with an installed rattler to entice fish from far away. It is an ideal lure for most fish species; esp. Jointed Fishing Lures Swim Plastic minnow Fishing Bait 14cm/21.2g Fishing Tackle. 5 X Fishing Lures. They create life-like swimming actions in water. 14cm 16.2g Laser Minnow Fishing Lure Pesca Hooks Fish Wobbler Tackle. Crankbait Artificia Japan Hard Bait Swimbait. smooth and rapid diving action. Hook: #4 high carbon steel Treble hook. they create life-like swimming actions in water.